This application makes perfect sense. A credit card issuer is liable for charges made on cards that are stolen, misplaced or otherwise misused. In 2012, unauthorized/fraudulent credit card transactions cost banks $6.1b dollars. It is in the credit card issuer’s interest to ensure that transactions involving a black listed card are caught right after the card has been flagged. 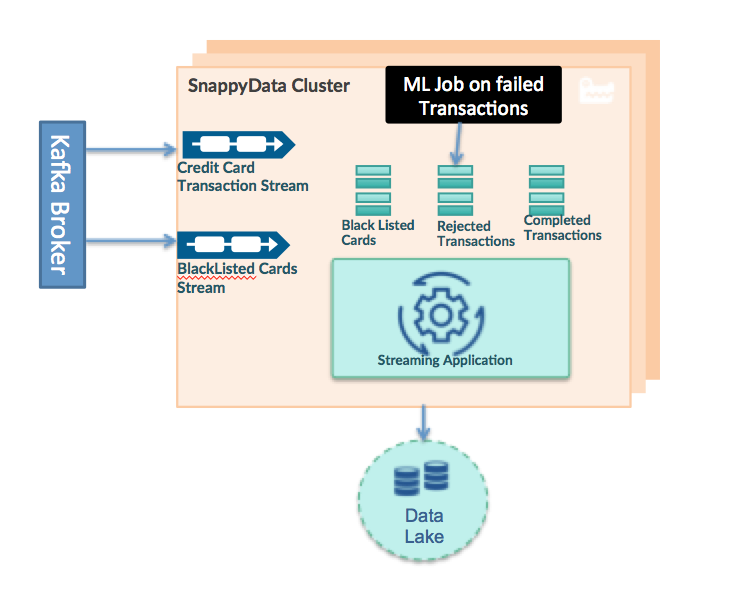 In short, a streaming DataFrame collects credit card transactions coming in over a messaging system like Apache Kafka. Existing blacklisted credit cards are loaded from a datastore (in this case, S3) into a static DataFrame in Spark’s cache. Spark SQL is written to join the streaming DataFrame with the static DataFrame and detect any incoming blacklisted cards. This works great until a new blacklisted card is added to the datastore (S3). Now the DataFrame containing the blacklisted cards must be reloaded from S3. During the reload, the streaming DataFrame must be stopped and then restarted while the static DataFrame reloads. As stated in the reply, this can take 10 seconds or longer, depending on data volumes. In that time frame, transactions could be occurring on that blacklisted card since it has not been recognized yet. Solving the problem of recognizing black listed credit card accounts in a stream of credit cards accounts is impossible to do in real-time in a pure Spark solution. So how can we use mutable DataFrames to make this solution faster and turn this into a continuous application? Step 2: Define a DataFrame that represents the blacklisted cards table. Note this DF will be Mutable. Step 3: Join the streaming DF with the blacklist DF and remove fraudulent cards. Write those transactions out to a rejected transactions table. Write the safe transactions to their own table. Step 4: (optional): Define a machine learning job using Spark MLLib that operates on the rejected transactions table to train models to detect fraud automatically. So what does this look like in code? Below we create the SnappySession object and use it to create a mutable row table for the blacklisted cards and then a column table for the rejected transactions. These tables are immediately materialized as DataFrames. Next we create a SnappyStreamingSession object to handle the streaming transactions then build the Kafka stream. We then create an object for each message in the Kafka stream. Finally we set up a separate stream for the blacklisted cards. In our example, we’re building the blacklist DF from a kafka stream as opposed to S3 for simplicity. This does not change the what is going on with the join between DataFrames and the blacklist DF is being continually updated by Kafka. Next we insert the new blacklisted cards into the blackList table and join the main transaction stream with the blackList table to discover fraudulent transactions and write them into the rejected transactions table. In the above code, we’ve shown how simple it is to have our blacklisted cards DataFrame be continually updated with new data (in our case, using a kafta stream) while maintaining a join to a streaming DataFrame of transactions without restarting or reloading. Because of this mutability, SnappyData can speed up the 10 second latency incurred by vanilla Spark every time the Spark SQL join needs to be restarted. Further, because of our 20x speedup over Spark’s native cache, the performance of the above application will be even faster. The ability to combine database like mutability (and reliability) into Apache Spark provides users with a single platform that can handle stream processing, SQL querying and Machine Learning all within the comforts of a very familiar Spark API, and all on live data. A data platform built for the big data era should offer reliability, security, elasticity, scale and latency, and democratize the ability for users to build live applications that are reactive, responsive and offer true predictive analytics. SnappyData offers that to users today. You can download it here. Shoutout to Sushma Goel for writing the code.